Interesting bit of news in the last couple of days with Sharapova’s ban being reduced from 2 years to 15 months and how it has been spun by Sharapova’s PR team. It just adds to the context for the game. With respect to the game design, I purchased a pretty nifty 70s-style office environment that gives my investigative journalist a really gritty home in between levels. Being of a 70s style just adds character, I think. Gives it that “All the president’s men” type of aesthetic. I will intersperse the environment with more up-to-date props like a laptop and smartphone. I think it adds to the backstory of the freelance journalist as someone of a set of principles of a bygone age – i.e legwork your way to the bottom of a story rather than relying on social media, press releases, public opinion to purely guide the story. In between levels, I can image stories breaking via a wire service (Reuters / AFP style) and these will direct the interviews in certain directions. The rotary dial phone will ring with a call from the commissioning editor – the tone of the conversation will be dictated by the articles submitted in previous weeks – e.g. if the editor is worried about litigation, public opinion, etc., he will voice concerns and this will challenge the player’s integrity and choices about what to write. Just adds to the moral complexity of the game – PEDs are a moral minefield in their own right, never mind journalistic ethics and integrity. Fitted in some work on the PhD today. Added the ability to withhold dialog and make it available as information about objects or articles, or notes, are discovered. 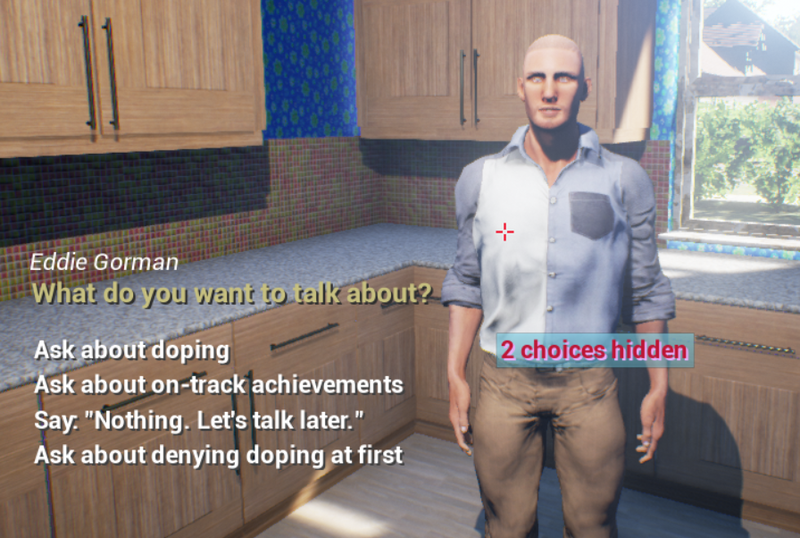 The player is also told how many dialog choices have been withheld. This will hopefully encourage the player to continue exploring to discover objects / articles and unlock the final parts of the conversation – all of this being ultimately linked to the article the player journalist will write, like uncovering jigsaw pieces that can be fitted together later. Thus far I can allow for up to 12 choices on one screen, with one of them being used to display how many choices are hidden. This could be multilayered, so there might be one object that when discovered opens up up to 12 more options – ad infinitum potentially; a dialog tree where each branch can lead to up to 12 more branches, some of the options immediately available, others hidden. Screenshot below shows an example where options that are not available are hidden and collapsed (i.e. we don’t have blank lines where choices are hidden, the one below moves up a spot to take its place).